Just hours after short positions on Bitcoin eclipsed longs, and as BTC shorts volume reached an all-time high, Bitcoin saw an explosion, appreciating over US$900 in under an hour, a growth of 13%. Since the pump, global cryptocurrency markets have risen over 10%, to just under US$300 billion. Speculators overwhelmingly agree that the cause for such a price movement was a textbook short squeeze. A short squeeze occurs when a sharp price movement forces the liquidation of short contracts, causing each losing trade to market buy their position. As a result, these market buys further push the price upwards, causing more and more shorts to liquidate. 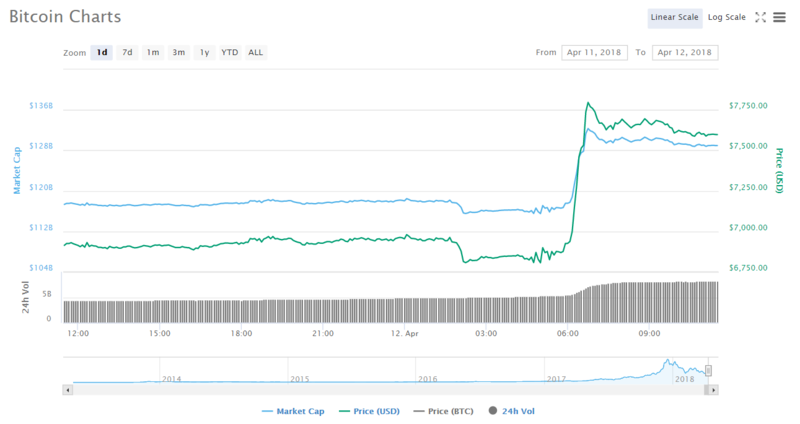 Either due to manipulation or natural movement, a small BTC price hike around the US$7,000 range sparked the force liquidation of thousands of losing contracts across all derivatives markets. Following numerous bull sentiments, including announced investments from the Rockefeller family and the European Union, it was clear that attitudes were shifting towards a reversal. Coupled with the fact that Bitcoin is down 70% since recent highs, the idea that there was still much money to be made shorting BTC in the immediate future now seems illogical. A similar event occurred at the US$20,000 all-time high, when BTC longs approached record volumes, and similarly were squeezed, shooting BTC down into the three month bear trend that’s currently been experienced. A short squeeze also occurred prior to the massive bull run that kicked off last year, when shorts similarly eclipsed longs on Bitcoin. Beyond just Bitcoin, cryptocurrencies as a whole have benefited largely from today’s jump. 40 of the top 100 coins by market cap have seen gains of 10% or more in the past 24 hours, led by Steem with a 35% growth, Bitcoin Private with 41%, and Mithril seeing a whopping appreciation of 165% in the past day. Given the increasingly positive perceptions and activities of cryptocurrency across the board, its very plausible that this growth can be maintained and even extended in the coming days and weeks. Also to be recognized is the suggestion that the extended bear market has shaken out those simply looking to turn a quick profit. Many of the new money to enter cryptocurrency during the holidays consisted of a general population ignorant of the underlying technology and motivations of cryptocurrency. When the next, extended bull run takes place, those who initially support it will consist largely of those who recognize the importance of Bitcoin and cryptocurrencies as a whole and the potential to revolutionize the world for the better. With overarching, dedicated support, there is a better chance for such movements to be sustained for as long as possible.